Game for a laugh: Lav and Lou in full Ugly Sisters mode. AWARD-winning Ugly Sisters, Dean Horner and Oliver Gray will join the line-up of the spectacular Christmas pantomime, Cinderella at Redditch Palace Theatre. 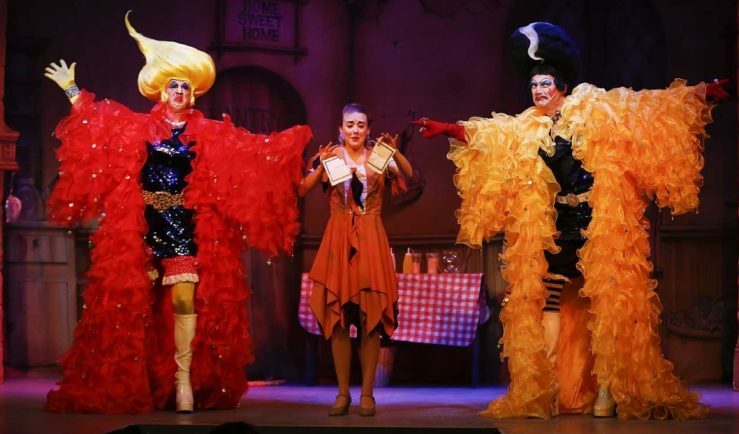 The duo won Best Ugly Sisters at the prestigious Great British Pantomime Awards 2016/17 for their outstanding performance in Cinderella at Derby Arena produced by the same team behind Redditch Palace Theatre’s annual pantomime. With more than a decade of experience working together as ‘sisters’ Lav and Lou, Dean and Oliver have built an enviable reputation as the ‘baddest’ sisters around with their outrageously flamboyant costumes and delightfully despicable treatment of poor Cinders garnering the biggest boos in Pantoland. Dean and Oliver join the previously announced Emmerdale actress Sapphire Elia in the title role of Cinderella and comedian, The Man They Call G, who returns to play Buttons after proving a great hit with Redditch audiences as Wishee Washee in last year’s Aladdin. Cinderella follows last year’s record-breaking production of Aladdin and with breathtaking special effects, sumptuous scenery and costumes along with plenty of classic panto audience interaction and an award-winning cast, promises to be more wondrous than ever before. Cinderella runs at Redditch Palace Theatre from Monday, December 9, 2019 to Sunday, January 5, 2020. Tickets are on sale now and can be booked online at www.redditchpalacetheatre.co.uk or via the box office on 01527 65203.